Get to know Rob Ceccarini, the main instructor of our Fly Fishing class, in this interview. 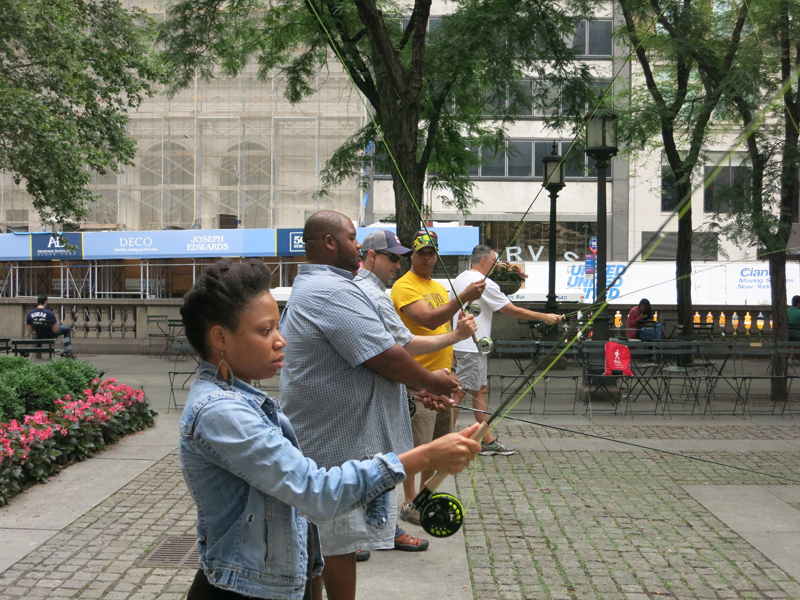 Fly Fishing, with Orvis, resumes on the Fifth Avenue Terrace this Saturday, April 23. I’ve been fly fishing since about 1999. A friend gave me a college graduation gift of a fly rod and introduced me to the sport. I teamed that rod up with an Orvis reel that I purchased from our Greenvale, Long Island store and received a lot of instruction from the staff. My friend and I would go to Caleb State Park on Long Island, where she was a park ranger, and fish the small streams and ponds on the property for panfish. Soon the fly fishing addiction took over. What’s your favorite part about fly fishing? Why should other people try it? My favorite part of fly fishing is the camaraderie and the hunt. Sharing the river with others and enjoying the beauty of nature is a wonderful thing: you have a chance to experience catching a bright spotted brown trout, watching a bald eagle gaze over the river from its perch, having a doe and fawn approach the river for a drink, or seeing the sunset over the mountains. You're sure to create lasting memories. I would say anyone who is interested in fly fishing will quickly learn that trout live in some beautiful places and even if you have a bad day due to not catching you’re sure to have a good day outdoors. Learn to cast and reel--without water! What’s your most exciting/amusing story from your personal fly fishing experience? I’ve had some very exciting days fly fishing including catching tuna on my honeymoon in Hawaii that we ate on the boat less than a minute after being caught. It doesn’t get much fresher than that. My most amusing experience was on a trip to Alaska several years ago. After spending what seemed like days to get to our final destination we decided to get on the water immediately. I spotted a trophy northern pike which later measured 45 inches and quickly got a cast off and hooked up. During the fight my reel feel off my rod. I was so excited to and pumped full of adrenalin when we were getting ready that I totally didn’t thread my reel on. When the reel fell off it bounced all over the boat while this massive fish went to berserk in the water. My buddy finally wrangled the reel but refused to give it back and instead took pictures and laughed at me while I tried to keep my wits about me. It may not sound that amusing but the pictures sure are. Where would be your dream fly fishing destination? Why? I recently knocked Belize off my bucket list of fishing destination and would put the Seychelles and Christmas Island near the top. The Seychelles are really remote and undeveloped and the fish are not just big but strong and nasty. I’d always be up for a trip out west to Montana or Colorado during the summer but there is no place I’d rather be than the Catskills in the spring. Class spaces are first-come, first-served. To register, visit orvis.com/newyorkcity and click the blue and gold “Join Us” banner.